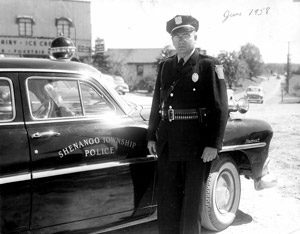 The Shenango Township Police Department was formed in June of 1958 with the hiring on Clarence Frampton as Police Chief and the only officer. Frampton was born on July 22, 1925, and passed away in July, 1984. He was also the Civil Defense Director of Lawrence County and a fire, rescue and judo instructor. He served the township until September of 1976, when he retired. At that time, David Rishel became Chief of Police. By this time, the Department had grown to two full-time and four part-time officers. Rishel served as Chief of Police until January of 1988, when he was elected District Judge, an office he holds to this day. Anthony ‘Lefty’ DeCarbo became the next Chief of Police following Rishel’s retirement in January of 1988, until he retired in March of 1998. Under DeCarbo, the Police Department grew to four full-time and four part-time officers. “Lefty” currently lives in Ellwood City. The next Chief was Alan Nocera. Nocera entered office shortly after DeCarbo retired and served until April of 2008. The Department grew to six full-time and two part-time officers. Nocera retired and currently still lives in the township. Between April of 1998 and January of 2010, there were three different Officers in Charge. The Department remained at its previous levels of manpower. 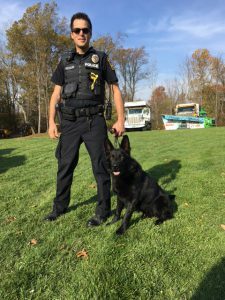 K-9 Officer Kalo with his handler, Officer Tressler. In January of 2015, Darrin Cwynar was appointed as Officer in Charge of Police. The Department has grown to seven full-time and two part-time officers. 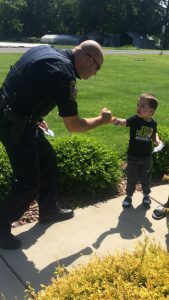 Over the years, the Shenango Township Police Department has added a Motor Carriers Safety Awareness Program, a dedicated Drug Enforcement Officer, a Sexual Assault/Child Abuse Investigator, a Fire Investigation Program and a K-9 Unit (pictured on right).